Y!StatusRevolution changes the status in Yahoo! Messenger with what song you’re listening to. It can also be used as a simple status changer. It’s based on macros so it’s very easy to use. For the beginning just select a predefined status, start your favorite audio player and click ok. Click “Macros” for a list of strings to insert in your status to have aditional info in your status besides the song name. You can have the length of the current song, bitrate, player volume and a few others. 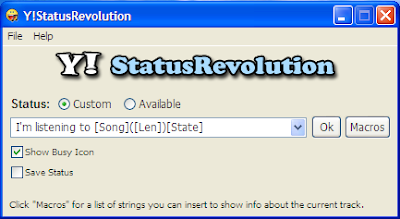 Y!StatusRevolution currently works with AIMP player and Winamp.